Hola Amigos! I know it’s been a long while, so let me dive right in. The rain has finally abated and our trench units have dried out, so we’ve been able to work on three different operations this past week! We worked in our stratigraphy trenches on the mound slope, continued searching for wall trenches and house corners on the mound summit, and continued coring in and around mound D.
There isn’t terribly much to say about the house on the mound summit yet, we’re still searching for another house corner (which hopefully wasn’t destroyed by trees or other processes) but as it stands, the summit structure may have had walls on the order of 8 to 10 meters on a side. We opened two additional units, 14 and 15, and found house floor and wall fall in 14. We’ll continue opening units on the summit, but we’ll prally be slowing down significantly to get ready for the end of the season. Once we find a corner and some trenches, I think our plan will be to cover the wall fall and house floor in filter cloth and then backfill over it. Sadly I’ll have to wait until next summer before I can really excavate the remainder of the structure, but, next year I’ll come back with a bigger crew and see what I can see. Test Unit 14 – Some consolidated wall fall and house floor can be seen. The dark patch in the middle is from a burned out tree stump. 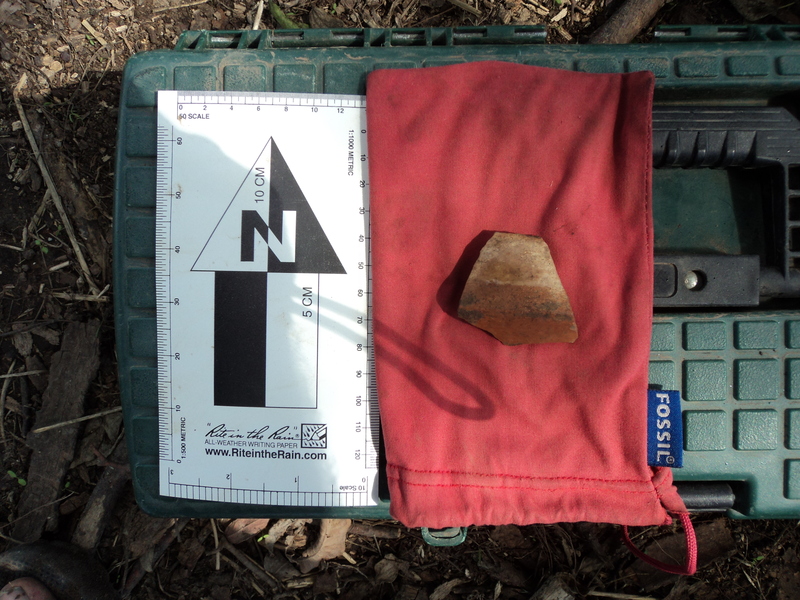 A very nice painted and carinated sherd from Tu14 – maybe Carson Red on Buff. Nodena usually has a space between the red and white, and Avenue has black between red and white. Comments? This week was really all about our stratigraphy trenches. In 2011, I excavatd several units into the slope of the mound and found some great stratigraphic information about how Mound D was built. 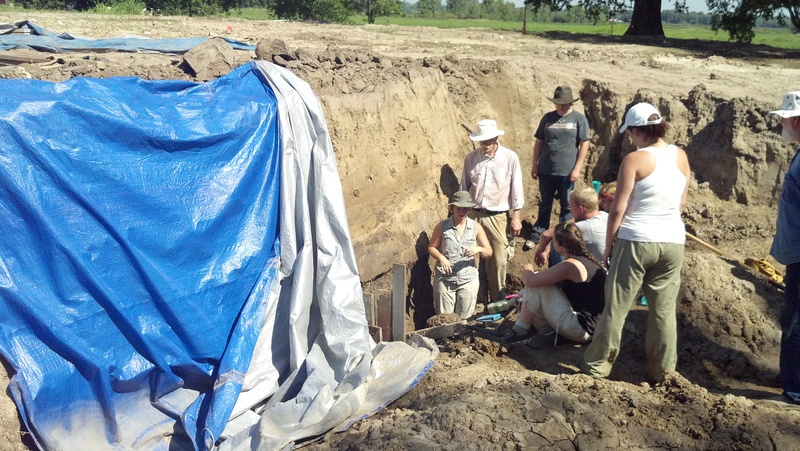 This year, we reopened the 2011 units, and opened two new trenches numbered 2 and 3. 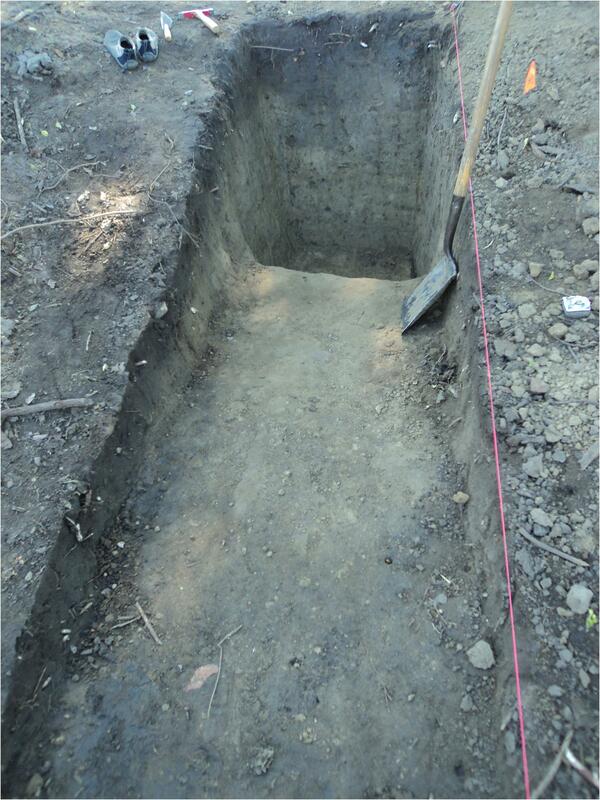 Trench 2 is located at the base of the 2011 excavations and is a perpendicular 1×5 meter trench. We’ve also started a new trench, 3, which is a step trench up-slope of the 2011 excavations. At the beginning of the week, trenches 1 and 2 were more or less completely flooded out and full of muck from slope wash and slumping. Last week’s rains really did a number on our walls and it really took us a long time to get them cleaned up again. Once they were cleaned out and troweled clean, we took advantage of our labors and photographed the profiles and floors. I’ll try my hand and making photo-mosaics of the trenches once I get the profile drawings completed. Above, the west profile of trench 2, some dark soils visible sloping downwards, and the clay platform beneath it. In 2011, I had some very unique and perplexing stratigraphy – I found a strata in the mound that had a vertical boundary, which to me indicated it was a pit of some kind. Given our work in trench 2 (shown above), the same dark soils seem to be sloping downward toward the center and rising up at the periphery, much like a pit. 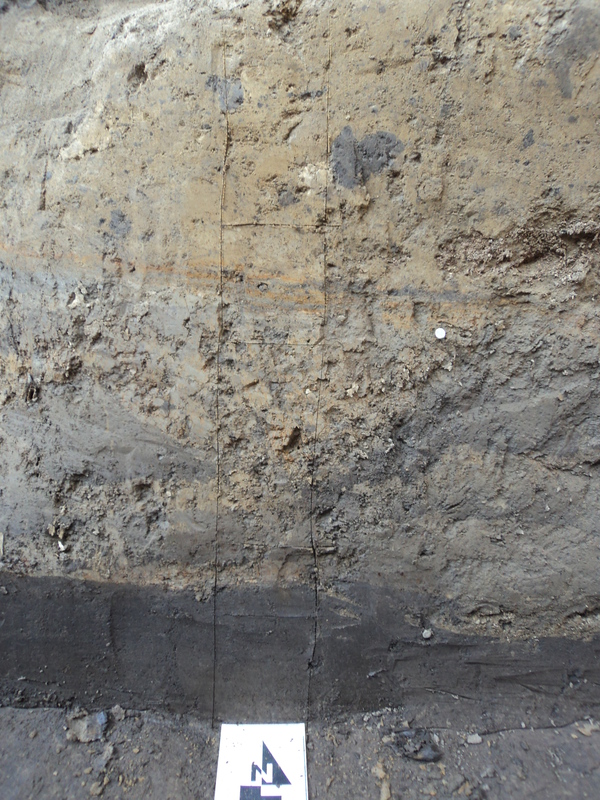 In the figure below, the grey strata to the far right is the same soil feature that is shown in the trench 2 stratigraphy. I was unsure if I had such large pit feature last year, but this year I think I have a very large pit at the base of the mound that has very little in the way of artifacts (no historics have been found). This pit is intrusive to both the first and second mound stages. Buried Anthrosol under the mound. The fill dirt in the lower right is from our 2011 excavations. The anthrosol in trench 2. The larger circular feature in the middle of the trench is shallow and basin shaped but no artifacts were found in the sediment. In addition to learning more about how mound D was built, the trenches have also allowed us to access the prehistoric ground surface under the mound. I was hoping by exposing this surface, I would find evidence of prehistoric pits, postmolds, and other types of activity. The surface is a very dark silt loam to a silty clay loam that has some mottling and charcoal, but unfortunately, very few artifacts and features. We’ve excavated all of the buried anthrosol and recovered some Late Woodland artifacts in the form of Mulberry Creek cord-marked pottery, which tells me at the least that there were people living in and around the area before the mounds were built. With our trenches open, I took the opportunity to collect some micromorphology samples to help with understanding time, environment, and taphonomy. Scribed sediment column that was sampled for micromorphology. 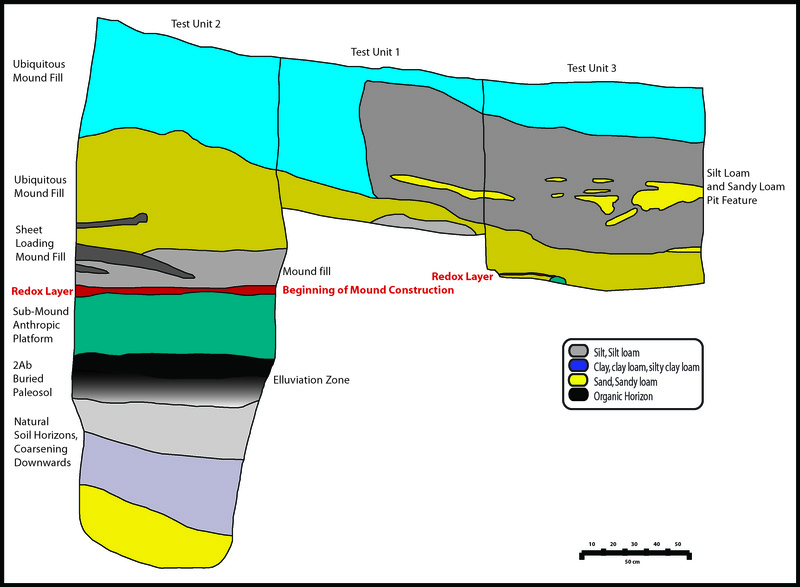 Contexts sampled were a potential redoxic layer that may also represent slope wash from a colored clay mound cap. Our work in trench 3 is proceeding slowly but I expect to find the first mound stage at some point in the trench. Since it’s made purely out of clay loam (+50 % clay), it shouldn’t be terribly hard to find. Michael Krause, Chris Higgins, and Steve Fortenberry, thinking about stratigraphy in trench 2 and 3. 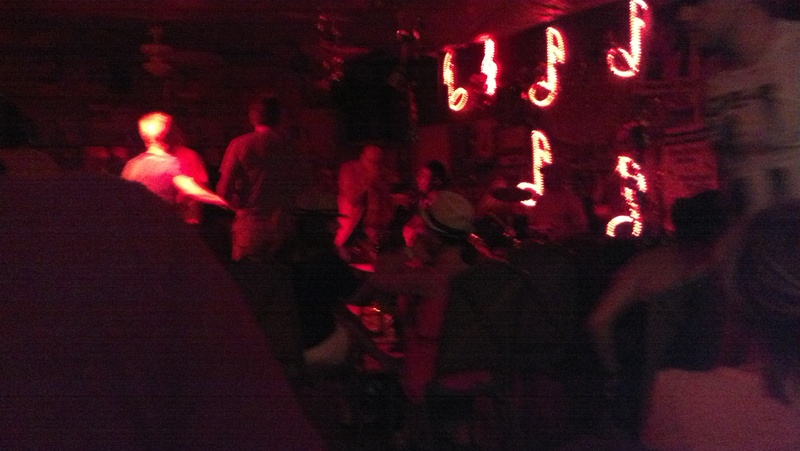 Some really cool things also went on last week. Rachel Stout-Evans gave a quick lesson to the Ole Miss students about soils, and she deserves a ton of recognition for all of her hard work out at Carson. Thanks for everything this year Rachel, 60 cores total, wow! 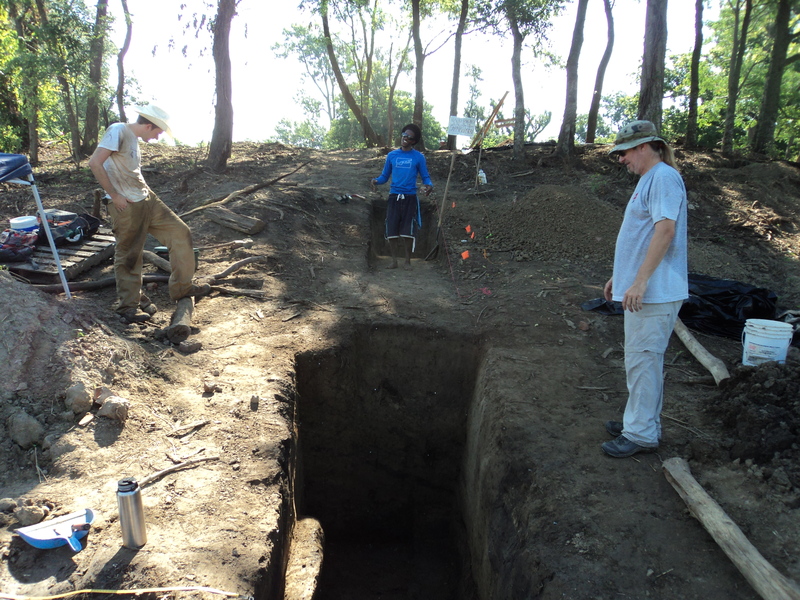 The Mississippi Archaeological Association also had their volunteer dig at the Hollywood site for Bryan Haley, see the picture below. 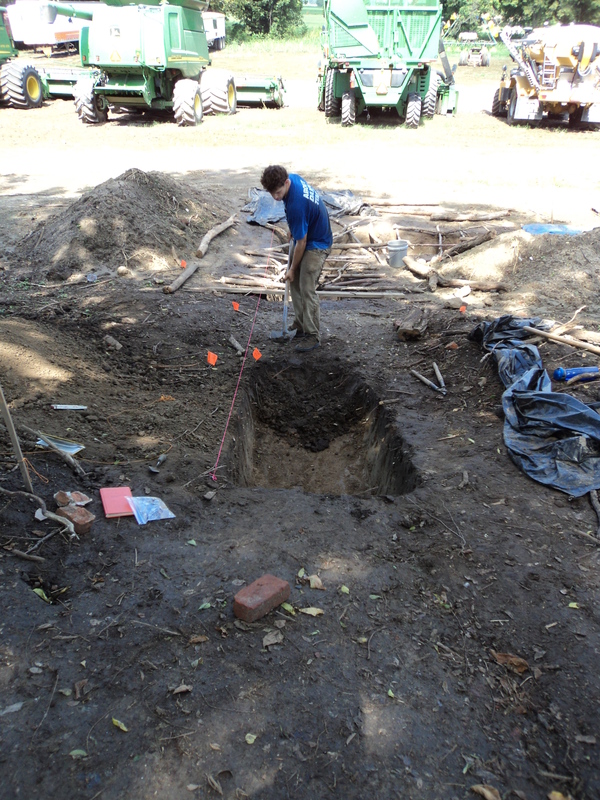 Bryan too has been lucky this year (prally more skill than luck) and he also has a really cool structure to excavate! And also thanks to the Tunica Museum and Richard Taylor for the wonderful lunch they provided!! 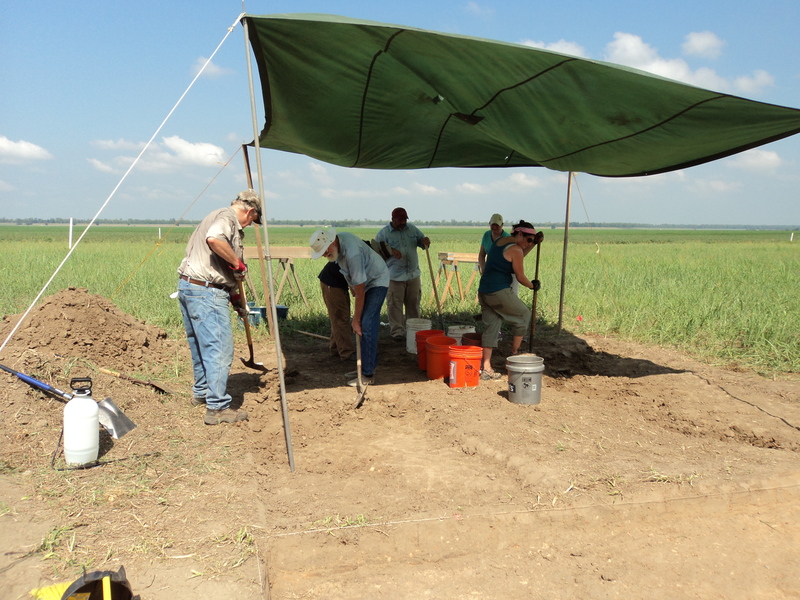 George Lowery, John Connaway, Nicole and Cliff Jenkins, and Haley Holt helping out on the MAA volunteer dig at the Hollywood site, Bryan Haley’s research project. We also went out to Helena, Arkansas for a great street fair and to see John Ruskey’s art opening at the Delta Cultural Center. 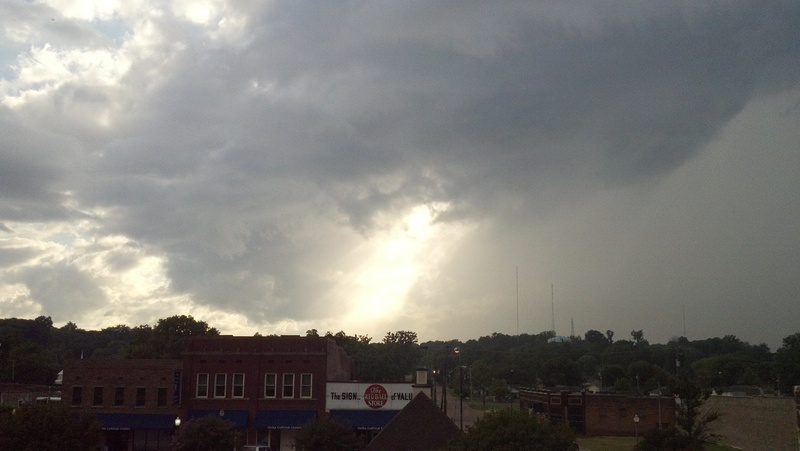 We were pelted by an awful rainstorm on the way over, but once we got to the city, we were treated to an amazing display of clouds and sun. What a cool old city! Anyways, this is my work, let me know if you have any suggestions or comments, enjoy!